Siri sends data to Apple, but is it something to get worked up about? IBM forbids employees from using Siri, but is their caution warranted? IBM issued an edict to employees banning them from using the iPhone's Siri, a voice command hub that acts as a virtual assistant for iPhone 4S users, in the workplace. "The company worries that the spoken queries might be stored somewhere," IBM CIO Jeanette Horan said. iPhone 4S users can access Siri by holding down a button, then ask "her" to locate late night tacos, jot down quick notes, or send an important email. And it's a well-known fact that Siri sends that voice data - as well as private data from users' phones -back to Apple to help parse through users' commands. In fact, it's even in Apple's iPhone Software License Agreement: "When you use Siri or Dictation, the things you say will be recorded and sent to Apple in order to convert what you say into text," the agreement reads. It continues: "By using Siri or Dictation, you agree and consent to Apple's and its subsidiaries' and agents' transmission, collection, maintenance, processing, and use of this information, including your voice input and User Data, to provide and improve Siri, Dictation, and other Apple products and services." 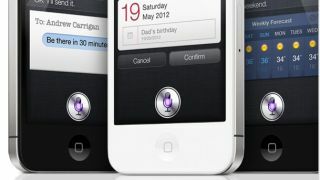 Plenty of services acquire user data, so why is Siri being singled out in this instance? "Siri seems innocuous because you're just talking to your phone, and it's not quite as obvious that you're interacting with something sophisticated and capable of storing enormous amounts of data about you," Chris Conley, a technology and civil liberties policy attorney at the ACLU of northern California, told TechRadar. "I wouldn't say that the typical user necessarily knows that." "IBM recognizes that," he said. The American Civil Liberties Union (ACLU) previously issued warnings about Siri's collection of user data, but should other companies be banning Siri as well? "IBM describes itself as very, extremely cautious in this regard," Conley said. "But I think they are right and other companies should be carefully thinking about how data is being collected, especially when you're looking at things like trade secrets or confidential communications." The data Siri is storing may seem harmless, Conley said, but "everything from location information to contact information to, you know, posts on social networks can be sensitive in certain contexts." Plus "it doesn't say how long any of this is stored," he added.